Lync Press – This is a site handled by paper.li which collects all of the #Lync twitter and my custom feed and presents them in a newspaper format. This is a good way to get a daily recap. Test Lync Connectivity – This is a link to www.testocsconnectivity.com. The display is a little wonky on Windows Phone but it does work. Find Lync Apps on Marketplace – Tapping this link will luanch the phones Marketplace app with a search scoped to the term “Lync”. There are several on here and maybe you want to download one or two to your phone. I’ve also added icons to the RSS feeds for all of the Technet Forums. Though responding to questions might be challenigng via the phone, it is a great way to keep up with any discussions you are involved with as well as to browse and read any new questions and resolutions. 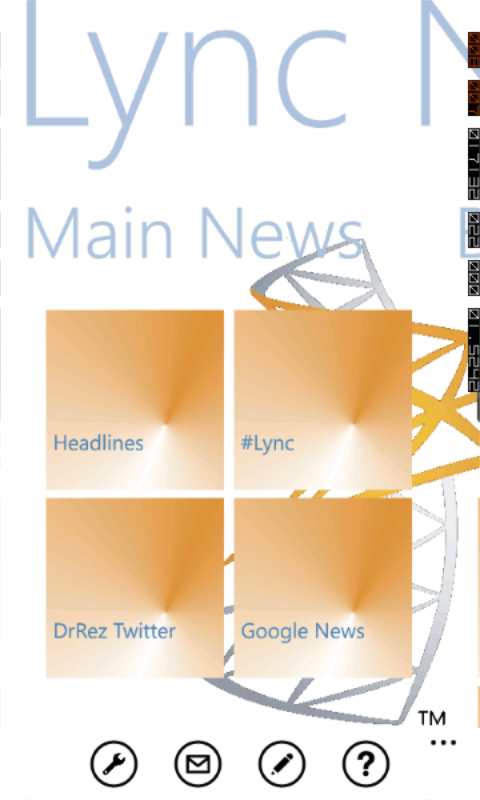 So far, Lync News has been downloaded 4,426 times.